An important source that describes CouchDB security is this reference page. We’ll look at most of it in this series. A peculiar feature of CouchDB security is that by default all users are authorised to perform any action in the database: create databases, delete documents, perform replication, you name it. If your CouchDB Fauxton – or Futon for older versions – UI is available on an intranet page within your company then all users within the company intranet will have access to the database. All users are anonymous so there’s not even any useful logging that shows who did what in the database. This leads to a page where Server Administrators can be created. 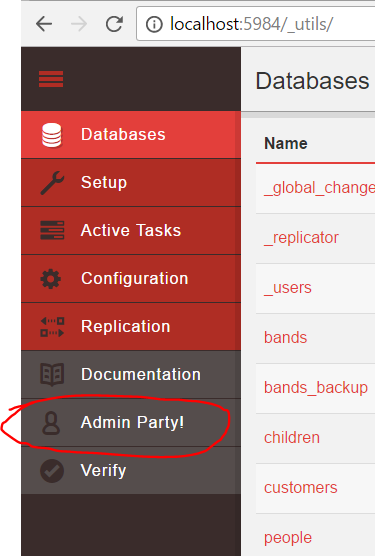 Server admins will have access to all databases, documents etc., i.e. everything we’ve done so far. Server administrators are not to be confused with DB administrators whose rights are typically constrained to one or more specific databases. We’ll look at DB admins later on as well. If end-users will be accessing this CouchDB, you must create an admin account to prevent accidental (or malicious) data loss. Server admins can create and destroy databases, install and update _design documents, run the test suite, and edit all aspects of CouchDB configuration. Non-admin users have read and write access to all databases, which are controlled by validation functions. 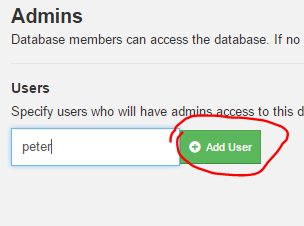 CouchDB can be configured to block all access to anonymous users. 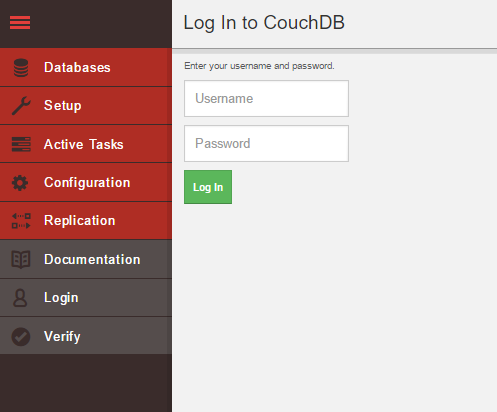 We’ll see the various user types and control mechanisms in CouchDB throughout the posts on security. So where are these server admin users stored? We know that there’s a database called _users. 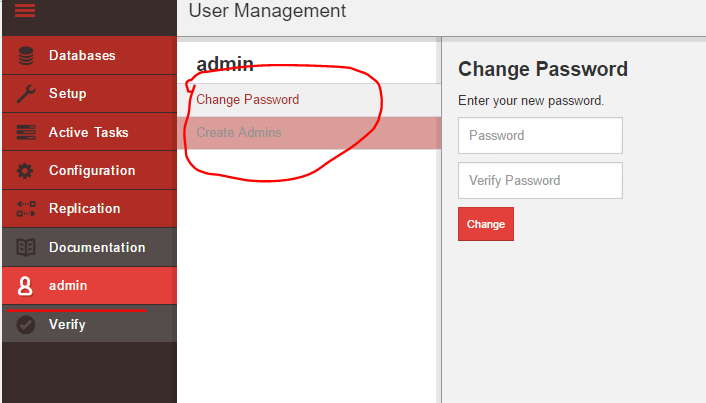 Log back in as the admin user and click on the _users database to see what it contains. No luck there, it only has a validation design document that’s triggered when a new user is entered. All “normal”, i.e. non-server-admin users will be added to the _users database. We’ll create one such user in the next section. Note that the _users database is a so-called system database and only server admins have access to system databases. System database names typically start with an underscore _. Normal, i.e. non-system databases are called user databases. We’ll see an important distinction between them soon. Database administrators will have extensive rights to a database. 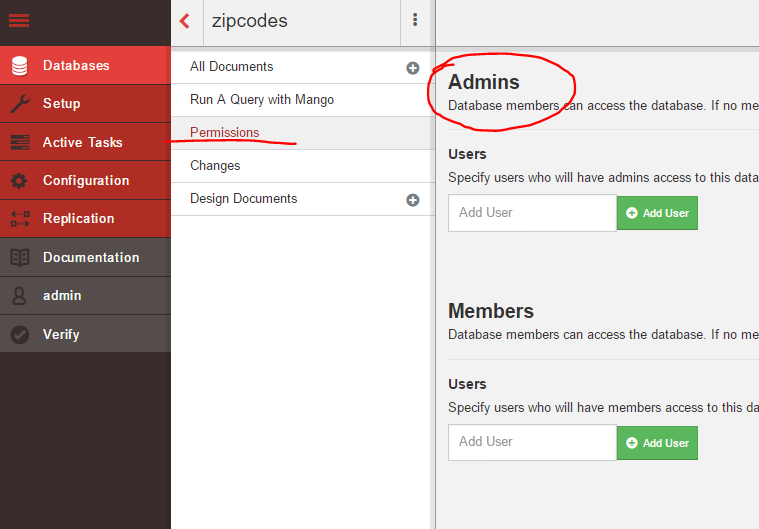 Only server admins can create new users and then they can be turned into database administrators or database members. We’ll see later on what a database member is. followed by a colon and then some name. The reason for this constraint is namespacing in CouchDB. All users must belong to the org.couchdb.user namespace and it currently cannot be changed, i.e. we cannot assign our own namespace. roles: users can be added to roles and this array will contain the names of roles that the user belongs to. We’ll ignore this for the time being, we’ll come back to roles in a later post. The update design document mentioned above is responsible for this conversion. Now log out and log in again with this new user. Let’s see what Peter can do. Go ahead and test the various functions in the UI while logged in as Peter. Peter won’t have access to the system databases. Try to view and create a new user in the _users database, it will fail. All server admin activities such as setup, tasks, configuration, replication, server admin creation etc. will be either disabled or will redirect to the login page. Peter won’t be able to create a new database or delete an existing one. The restrictions are good but the default user can still manipulate the documents in the user databases. We’ll remedy that in the next section. Peter and Mary are still not allowed to perform server admin activities like configuration changes but they are given admin functions on a specific database. They are administrators of the zipcodes database, nothing else.